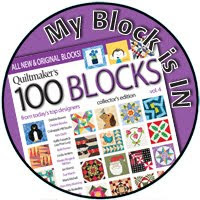 So I started with two blocks. Then two more the next day. And before I knew it I had a direction to go - finally! 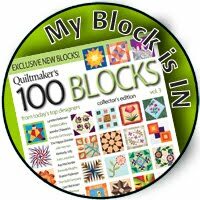 These cottage blocks have sat around since 2010. 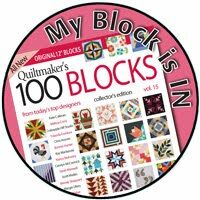 They are the signature blocks that I had my Sew Modern Bee mates make when I did my Liberated Churn Dash Quilt. I've been struggling to figure out how to set them for, well, years. Lately I've been seeing quilts made up of quarter log cabin blocks and really like the visual effect. 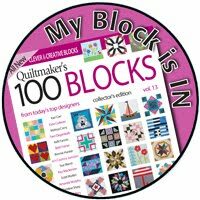 Plus the idea of making a quilt bigger using partial blocks intrigues me. I kept going quickly and then I took a road trip. A trip to Sudbury, my closest big city down a major highway. A northern highway mind you, full of beautiful scenic views. This trip made me realize that adding tree blocks would add to the log cabin landscape I was building. I made a plan and changed it. 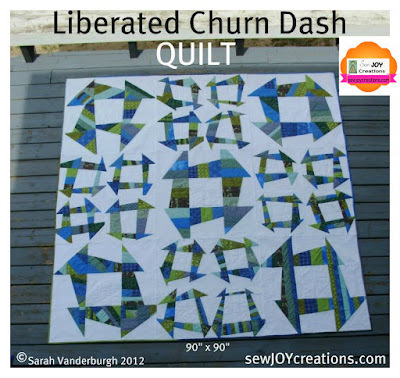 My husband was the recipient of my Liberated Churn Dash quilt. He set the palette - no orange, remember! 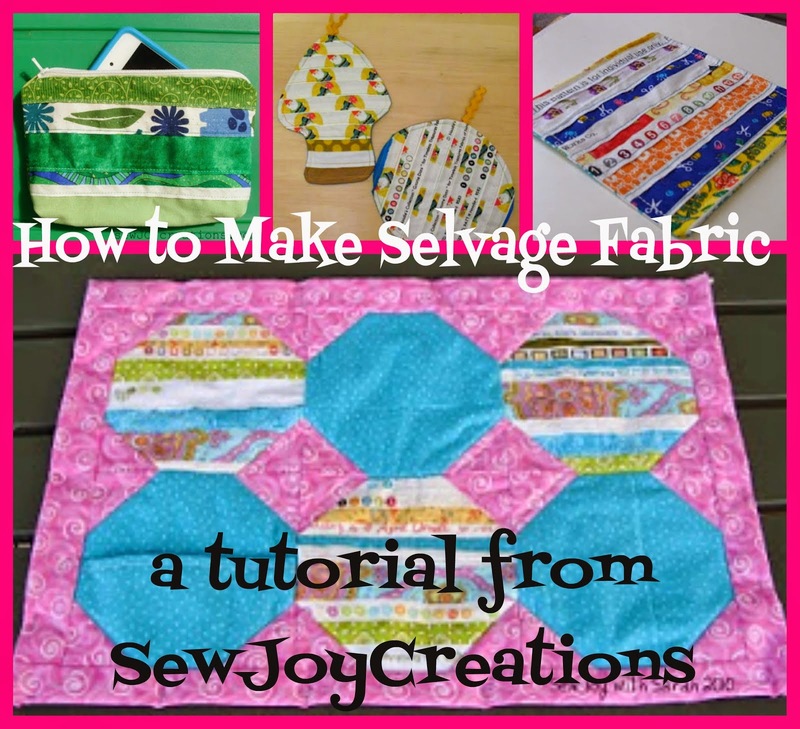 This quilt is made up of the leftover fabrics from that quilt. And I'm making it to celebrate our 20th wedding anniversary (which is why I was feeling pretty bad to set it aside for another year - and then really happy to work on it!) 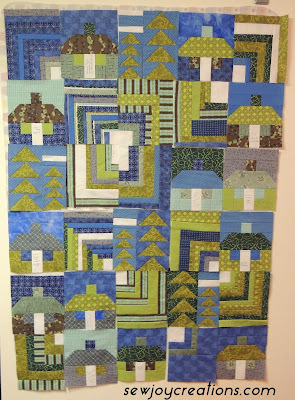 There was a lot of fabric leftover and I figured more blocks would make the quilt bigger AND use up the fabric. 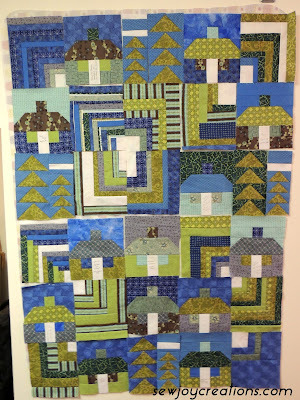 So I made some tree blocks using the fast flying geese method in two sizes. 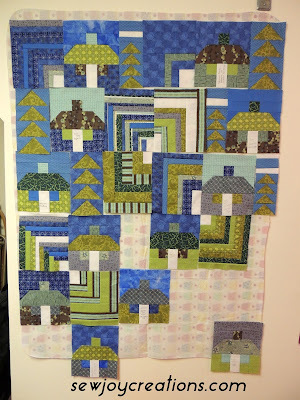 My hubs was consulted on size - he said couch size and definitely not a wall quilt - and then again once I had more of the quarter log cabin blocks made. 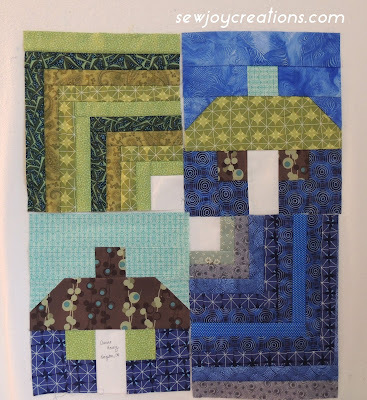 He wanted to see a *whole* log cabin block so that's why I turned some to make a full block. And then I had to change up my designing process. I was going to make the quilt 4 blocks across and then 6 rows down and repeat the log, cottage, log, cottage blocks then cottage, log, cottage, log to get the design I wanted to emphasize. Adding more blocks to a row changed that. Adding the whole log cabin block changed that! Adding the trees changed that! But you know what? 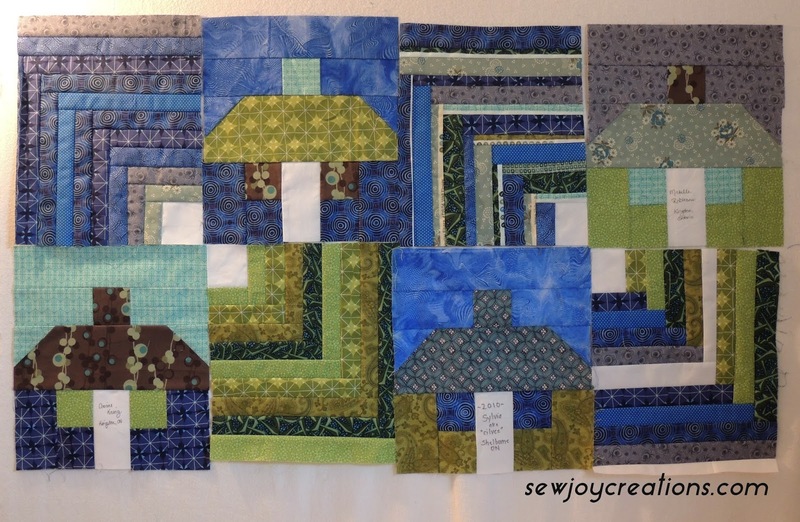 All that change felt good - it felt good to make and think about and create with the blocks and fabric. 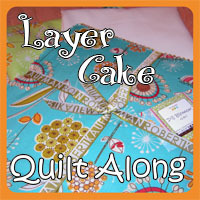 Creating this quilt I felt the way I have wanted to feel making a quilt - in tune. In flow. In the moment. You can see the changes as the quilt grew. I was getting frustrated that I couldn't see each row at the same time. It seemed like I would have to make the quilt in two halves and I wasn't really sure that was going to work. Then I decided that I could just get out a flannel back tablecloth and make myself a bigger design wall! 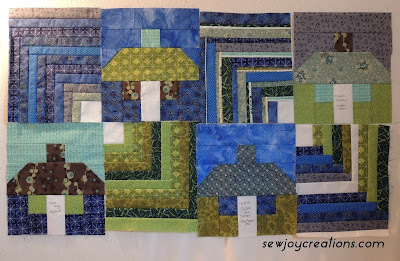 It is my house;) The large design wall has added so much to this process - it made it possible to be a process instead of a pattern. Does that make sense? 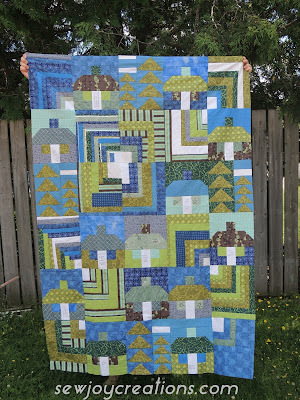 The quilt top is finished and I'm happy with it - really happy! 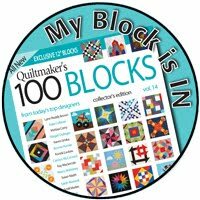 The quilting will take some time as I'm not sure exactly how I want to go about it yet. The extra design wall is staying, for now. I plan to use it all summer and then see if I can live without it. Do you use a design wall? 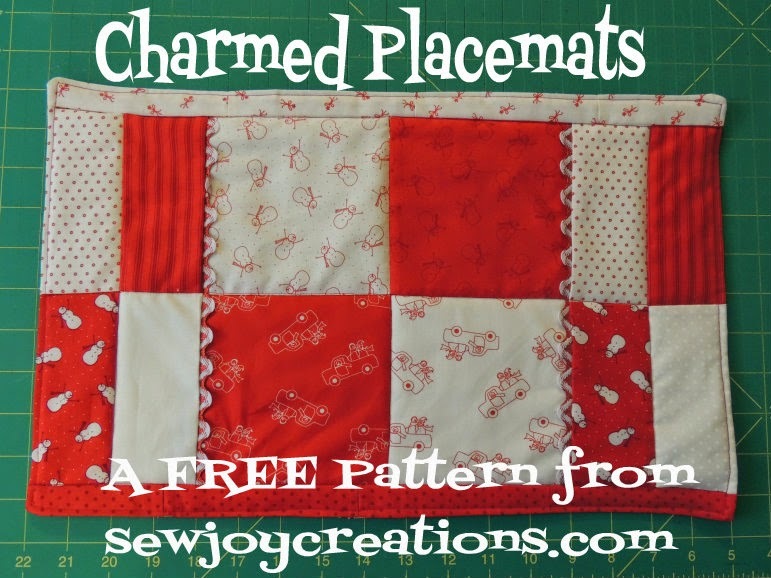 Thanks Beth :) I am still using the same flannel sheet for my main design wall that I started with more than 10 years ago! I have also in the past used a bright orange shammy for drying cars - anything that fabric will stick to is game for me!